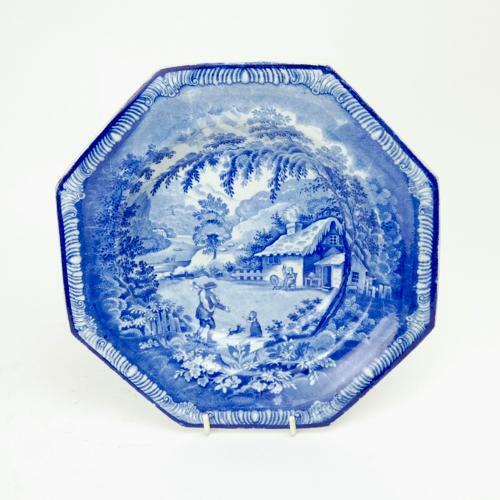 A blue and white, transfer printed soup plate. This has an impressed mark, 'BRAMELD', within a cartouche of flowers. This is one of the marks of the Rockingham Works in Yorkshire and it dates from c.1820. The transfer print is very good quality and it shows a woodcutter returning to a cottage. The transfer design fills most of the octagonal soup plate and there is just a narrow border. It is potted in pearlware, and has a blue tint to the glaze. There is a small chip to the reverse, on one of the corners. This does not show on the face of the piece. Other than this it is in good condition. Price includes postage with the U.K. Shipping to the U.S.A. add £20. Western Europe add £10.